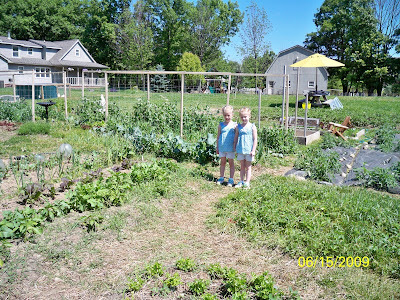 We are trying out Community Supported Agriculture (CSA) this year. As mentioned in a previous post, this is a local farm that sells shares of it's produce, eggs, milk, etc. to individuals for an entire growing season. We purchased one of those produce shares and pick up whatever is ready that week every Monday. 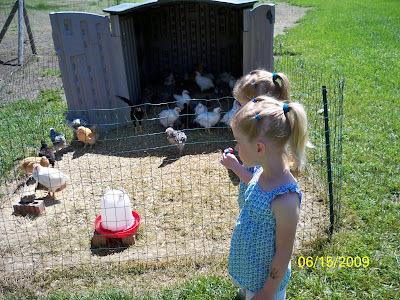 This week I took the girls out to see the farm and the farm animals. 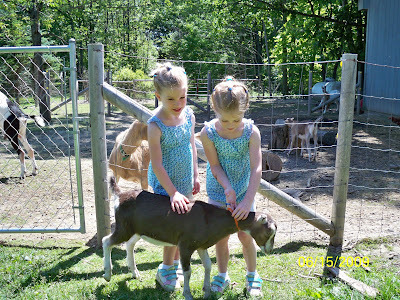 They enjoyed petting the goats (and the family cats), picking strawberries and gathering eggs. It is fun knowing where our food is actually coming from. I can't help but think about the rows of lettuce as I eat my lunchtime salad. I could tell that the owner of the farm loves what she is doing and it feels nice to be able to support her efforts and have healthy, chemical-free food for my family. CSA's where we live usually work on selling their shares in January or February for the season. Here in Michigan the season is about 20 weeks long. If you are interested in finding a CSA where you live, check out Local Harvest. In addition to CSA information, you can also find out about local Farmer's Markets, another great way to support your community growers. Children really need to experience farm life... They are so cute! I am making inquiries into CSA in my area, as well as organic markets.